Also the other if you need it. Better put enough in the checking account from time to time to keep it up so if I should want it I could get it. You know, I had a wild notion last night. If I should find Panama very delightful and living quarters could be arranged, I wonder if you would like to come down say in early November and stay a few months. I could come back up with you, say, in March or whenever you thought you should be back. Then I could stay, or go back after three weeks' leave as we decided best. I'm sure I could swing it financially. We might keep it in mind. I must read some more on my book now. Did you get the registered letter, & can you send the insurance policies to R.C.? I'm enclosing $5. to help pay the express on the suitcase & bedroll. 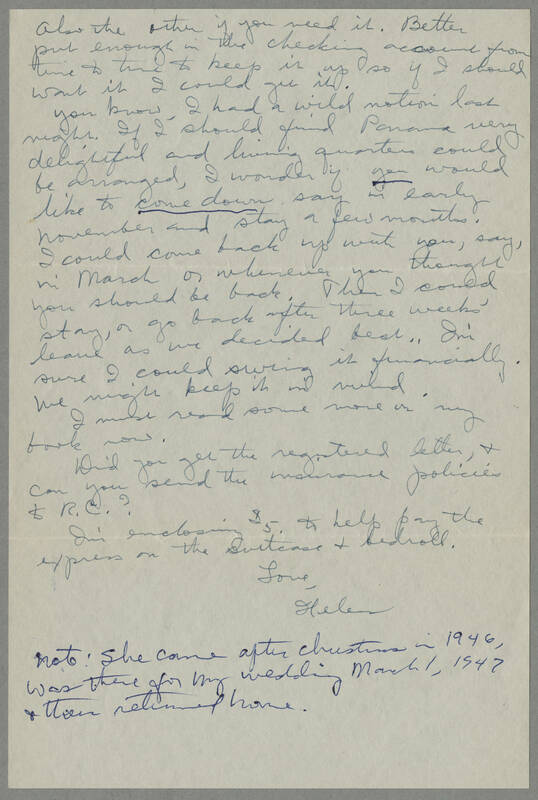 Love, Helen Note: She came after Christmas in 1946, was there for my wedding March 1, 1947 & then returned home.